“He wakens me morning by morning, wakens my ear to listen like one being taught,” (Isaiah 50:4b). If you had been among the 1,097 morning commuters bustling through Washington D.C.’s Metro station at L’Enfant Plaza on January 12, 2007, you could have experienced an extraordinary gift. Tucked among the shoeshine vendors, newspaper kiosks, and lottery ticket dispensers, a young, white man in jeans, a long-sleeved T-shirt, and a Washington Nationals baseball cap positioned himself against the wall beside a trash can. From a small case, he removed a violin. Then he left the open case at his feet and threw some spare change into it. Then he turned toward the huddled masses of rush hour commuters and began to play. If you had been one of the seven who paused during their mad dash to work, you would have had a front row seat to Joshua Bell playing six of Bach’s most difficult and exquisite violin pieces on a $3.5-million, 300-year-old Stradivarius…for free. It was an experiment by Gene Weingarten of the Washington Post. Joshua Bell, a concert violinist who normally earns $1,000 a minute, agreed to participate. As each commuter passed by, he or she had a decision to make. Do I have time for beauty? Do I have time to pause, turn aside, and listen? The fiddler standing against the bare wall at the top of the escalator was one of the finest classical musicians in the world, playing some of the most elegant music ever written on one of the most valuable violins ever made. And 1,090 busy men and women missed the gift because they were in a hurry. Every day we have a choice. As we make Acts 17:28 a practical and perpetual reality in our lives, we will have a choice. As we live and move and have our being in Christ, we can rush through the day and miss God’s magnificent displays of glory and articulate words of love, or we can turn aside and savor the incredible gift. As we go through life, there comes a whisper, a faint call, a luring pull to a richer life which we sense we’re passing by. Outer hurriedness and inner uneasiness are laced with hints that there is something more, something better, something that we’re missing in the blur of life. “What could it be?” we ask. When we embrace true union and abide in Christ, continual conversation becomes a way of life. All through the Bible we see that God spoke in various ways through various means. He spoke through dreams and vision, though a burning bush and fiery mountain, through a donkey and an angel. He spoke by writing on the wall, wetting a fleece on the ground, and forcing an almond branch into bloom. The important thing is not how God spoke, but that He spoke. Equally as important is for us to remember not how He will speak, but that He will speak. And each one of the gentle whispers or startling shouts from God’s heart to your heart carries within it the potential for moments of sudden glory. The key is not to miss it. I pray Jacob’s words will never come from my mouth or from yours: “Surely the LORD is in this place, and I was not aware of it,” (Genesis 28:16). Instead, let’s listen in expectation with the words of Isaiah on our lips: “He wakens me morning by morning, wakens my ear to listen like one being taught,” (Isaiah 50:4b). His lavish response to our longing for something more awaits those who anticipate glory moments and awake in expectation. Heavenly Father, thank You for loving me, Your daughter, enough to show me glimpses of Your glory in everyday life. Help me not to miss them. Help me not to be so busy in the blur of life, to miss You, the Source of Life. Today, I want to challenge you to notice five “beauties.” It could be a song, a person, a sunset…whatever catches your attention. But…you have to pay attention. Then click on my Facebook page and tell me five things of beauty you noticed today. God’s articulate presence is in all of life, we just need to learn how to recognize it. 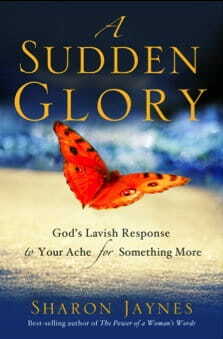 Click here to watch a video about A Sudden Glory: God’s Lavish Response to Your Ache For Something More and get a taste of what God wants, not from you, but for you. This might be the perfect gift for that friend who is longing for something more from life.